Sometimes it is the seemly small insignificant detail that will take a station off the air. To expound on that a bit, I have my own story which happened yesterday. The back story is this: About three years ago, some unauthorized tower climbers climbed the WICC south tower all the way to the top. The station remained on the air at full power while this was going on. Once at the top of the three hundred foot tower, the climber, we can call him “Crack Head,” manged to loosen, then remove the beacon and throw it to the ground. Mind you, this guy had no safely climbing equipment whatsoever and he had to stand on the top plate, which is all of 20″ x 20″ square, of which the beacon takes up 16 inches. A two inch purchase between himself and eternity demonstrates that God does indeed smile on fools and drunks. Fortunately, his friend on the ground had a video camera and filmed the entire episode. Even better, they then posted it on Youtube. The police took interest in this video and it’s owners because the damage to the radio station was significant, and with the tower being about a mile away from the end of the Stratford Airport runway 17, presented a real hazard to air navigation. Needless to say, the video was used by the prosecution and both crack heads are now in prison, God having limits after all. A spare beacon was hoisted to the top of the tower an placed in service. This beacon was quite old and leaky and continually failed, burning out the tower light flasher. Thus, it was time to replace it. We took advantage of the outstanding weather and the crew from Northeast Towers made quick work of it. Removing and lower the old beacon to the ground, then hoisting the new beacon up and installing it. I goobered it by not taking pictures of the beacon fixtures flying up and down the tower. 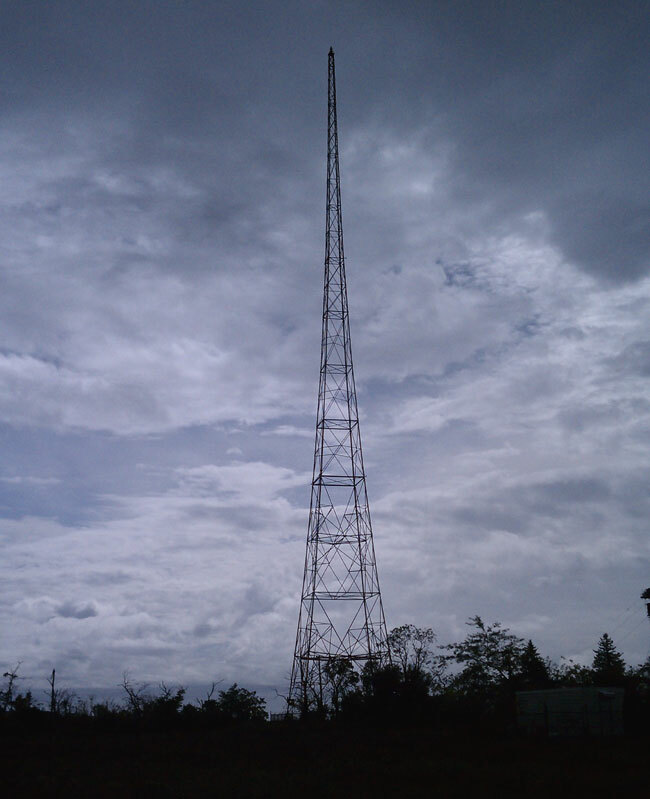 I took the station off the air for about five minutes to check the condition of the wiring going up the tower, making sure there were no shorts up the tower or back toward the transmitter building. While I was doing this, I overheard the two way radio conversation between the tower climber and the ground crew on wiring. It seems the old beacon had only two wires, hot and neutral. The new beacon had three wires, hot, neutral and ground. Tie the neutral and ground wires together, instructed the tower boss. Nothing more was though of that, it sounded okay to me. Unfortunately, the tower had other ideas. About an hour after we secured from the job and drove away, the station went off the air. It seems the neutral wire was not referenced to the tower previously. Because now the neutral wire was tied to the top of the tower, the RF found a path to ground via the tower lighting choke at the base of the tower. It started arcing to it’s access door causing the transmitter to go off around 4 PM. Equally unfortunate was the fact that the construction gate was closed and I had to get a boat ride with the harbor master, which took about an hour to arrange. The entire situation was further complicated by darkness, which comes predictably around 6:30 PM this time of year. When I arrived back out at the base of the tower, I took the metal access door off of the tower light choke cabinet. I could see the fresh track marks all across the bottom of the door. With the door off, I turned the transmitter on. Worked just fine. I tried cleaning it off with a Scotch Bright, but to no avail, the transmitter would not run at any power level with the door in place. Finally, the harbor master becoming impatient and darkness quickly falling, I taped a garbage bag over the tower light choke box with the door off and turned the transmitter back on. The tower crew will have to come back and remove the ground wire on the beacon. The first rule of trouble shooting: Check the last thing that was worked on first. Update: And look, here is the original story in Radio World: Tough times a Pleasure Beach.